The general manager of a Tindle Newspapers-owned weekly has said there is “no need” for the closure of local newspapers across the country. Caroline Attya, general manager at the Glamorgan GEM, believes better management of staff would have saved former titles now consigned to history. 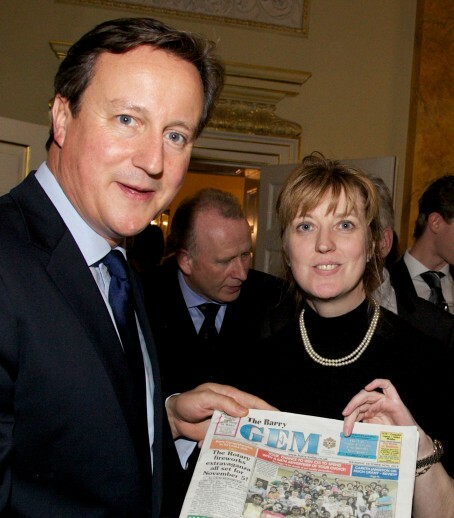 Her comments come after she met Prime Minister David Cameron, pictured with her, during a recent reception for local media at 10 Downing Street. Caroline hand-delivered a copy of her newspaper, a free weekly, to the PM during the reception. She said: “We are owned by one of a rare breed of newspapers owners who still believe that keeping it local is the best formula. “We still work in our own communities. “There is no need for the downfall for many of the newspapers that have been closed, they just needed honest managers who care about their experienced and enthusiastic staff. Recent weeks have seen a spate of closure announcements with the Reading Post ceasing print publication to go online-only and the Surrey Herald, Surrey Times, Woking Informer and Harrow Observer axed altogether. No need to close local newspapers, she says. But how is she going to address the massive decline in circulations that have heralded such closures? Let’s face it, most of the regional press is so establishment and boring. The Tindle press is notoriously Conservative with a capital C. The photo of Cameron says it all. Ermmm, if only it were as easy as that? It IS as easy as that, unless you are owned by a giant corporation run by suits with marketing/advertising/finance backgrounds and in thrall to corporate shareholders who insist on ridiculous profit margins of 20% or more every quarter. My paper wrecked by a greedy national company will very soon close its doors to the public for the first time for about a century. Slap in face to population it pretends to serve. If Tindle can do I better, good luck, but that splash looks very dull! What about the massive drop in circulations, doesn’t that have some bearing on whether papers stay open or not? Most regional news organisations are establishment and boring like that photo of Cameron. Jupiter. Agree with you. Shame the massive drop in circulations was part of the deliberate “decline management” of several companies. I have been told by one JP manager that the bosses did not mind if circulations fell because it saved newsprint and other costs. They got the sales decline right, they are superb at that. Now they are dishing out vouchers to try to get them back. You just have to laugh at such folly, or weep at such ineptitude. Surely something newsy happens in Barry? Every Tindle title I’ve seen has been dreary beyond belief, but give him his due: he does believe in hyperlocal editorial and is prepared to back his philosophy with his own money. In his own rather pedestrian, low-key way, Tindle has kept papers alive, often against the odds, and his employees tend to appreciate him for it. Better a dull paper than no paper at all! If I had a choice between Tindle (always an optimist and, incidentally, a former journalist) and a know-nothing corporate suit in thrall to shareholders, I’d take Tindle every time. I’m NOT a Conservative, neither am I particularly conservative. Yet I work for Tindle and believe we’ve a future. It means damned hard work with few resources but if you’re committed to the industry – and serving the public – that goes with the territory. Rather our way than the Local World model and its newspeak gobbledegook that dresses up job losses and contraction as opportunities. Yes, our business could do with investing more in technology as we need to adapt to changing times but then most things come to those who wait. It’s fair to say the last two papers I was made redundant from I had never met the managers. Which is why the paper was struggling and I had to be laid off. I’ve taken jobs outside the industry and boy, now I’ve witnessed how to properly manager a profitable company down to the finest detail.